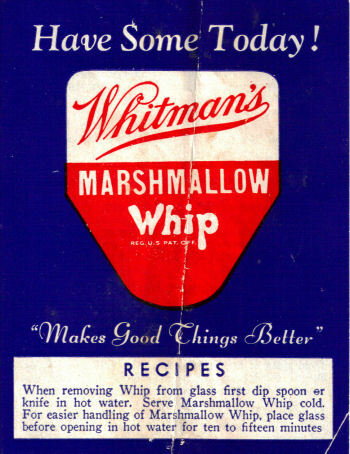 Here’s a little vintage treasure, it’s a recipe folder for Whitman’s Marshmallow Whip (who knew you could do so many things with marshmallow whip). Date of this is unknown. All the recipes are typed below along with scanned copies of the folder (the large graphic with two pages can be clicked to view a larger size). When removing Whip from glass first dip spoon or knife in hot water. Serve Marshmallow Whip cold. For easier handling of Marshmallow Whip, place glass before opening in hot water for ten to fifteen minutes. Place Whip in bowl. Add hot water gradually and mix thoroughly between each addition. Beat with spoon until smooth. Beat the white of egg until very stiff. Add Marshmallow Whip and beat until smooth and fluffy with heavy duty egg beater. Drop on top of dessert. To use as a meringue glace or on puddings or pies, place in slow oven (250° F.) for 15 minutes, or until delicately browned. Place contents of 5-oz. glass Whitman’s Marshmallow Whip in small size electric beater bowl. Gradually add 6 tablespoons (1 1/2 ozs.) hot water with beater on slow speed. When water is mixed in put beater on high speed for 8 minutes. Keep Marshmallow down from sides of bowl during beating. Will keep its delicious consistency for several days if covered and placed in ice trays of freezing compartment in electric refrigerator. This Marshmallow consistency is excellent for mixing with whipped cream to make ice cream in the electric refrigerator. 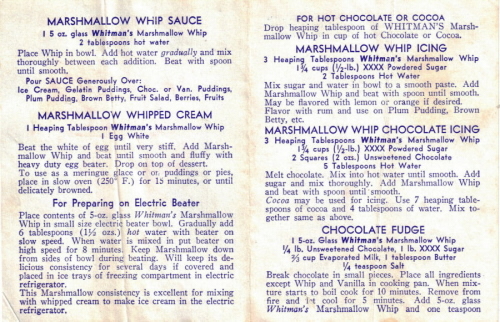 Drop heaping tablespoon of WHITMAN’S Marshmallow Whip in cup of hot Chocolate or Cocoa. Mix sugar and water in bowl to a smooth paste. Add Marshmallow Whip and beat with spoon until smooth. May be flavored with lemon or orange if desired. Flavor with rum and use on Plum Pudding, Brown Betty, etc. Melt chocolate. Mix into hot water until smooth. Add sugar and mix thoroughly. Add Marshmallow Whip and beat with spoon until smooth. Cocoa may be used for icing. Use 7 heaping tablespoons of cocoa and 4 tablespoons of water. Mix together same as above. Break chocolate in small pieces. Place all ingredients except Whip and Vanilla in cooking pan. When mixture starts to boil cook for 10 minutes. Remove from fire and let cool for 5 minutes. Add 5-oz. glass Whitman’s Marshmallow Whip and one teaspoon vanilla. Beat vigorously for approximately 8 minutes. Pour into buttered pan and when cool, cut in squares. Makes 1 1/2 lbs. fudge. Chopped nut meats may be added. Bake or boil potatoes until soft. Remove skins. Mash and mix with butter, milk and salt. Mix in a heaping tablespoon chopped pecans or almonds. 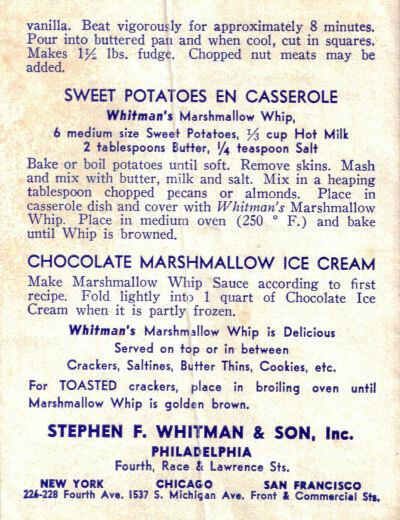 Place in casserole dish and cover with Whitman’s Marshmallow Whip. Place in medium oven (250° F.) and bake until Whip is browned. 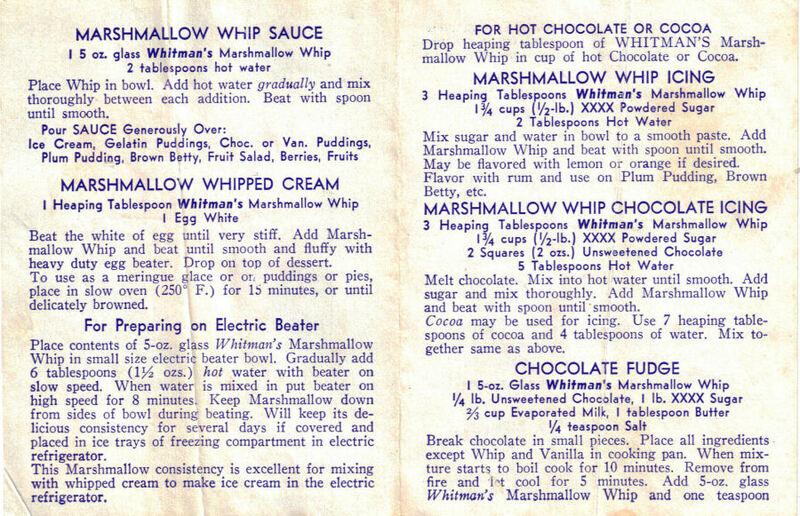 Make Marshmallow Whip Sauce according to first recipe. Fold lightly into 1 quart of Chocolate Ice Cream when it is partly frozen. Crackers, Saltines, Butter Thins, Cookies, etc. For TOASTED crackers, place in broiling oven until Marshmallow Whip is golden brown. STEPHEN F. WHITMAN & SON, Inc.